Sauti Sol of Kenya 2014 winner of MTV Africa Best Act will kick off their US tour in Minneapolis on May 21, 2014. 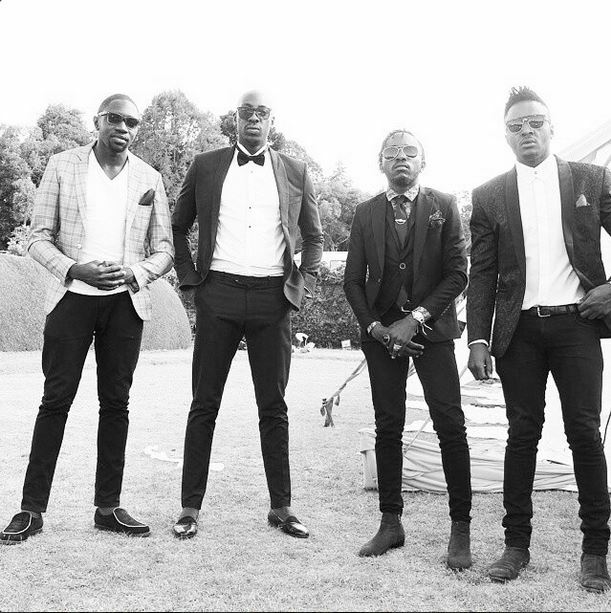 If you haven’t already heard of Kenya’s Sauti Sol, get to know them now. Because on Thursday May 21st, the group will be bringing their music to fans in the diaspora, as they kick off their five city U.S Tour in Minnesota at C’Est La Vie. A show that is sure to set the stage and expectations for the rest of their tour as they head to D.C., Dallas, Atlanta, and Seattle. Sauti Sol, who released their first album in 2009 have witnessed the kind of success most artists can only dream of, and collected an impressive list of accolades along the way. But the four man afro-pop band comprised of Bien-Aime Baraza, Willis Chimano, Polycarp Otieno and Savara Mudigi, truly found their niche in 2014. This was the year that they set the internet ablaze with their raw talent, killer moves, and some bare chests, transforming them into a household name, from Dar-es-Salaam to Nairobi and Johannesburg to Minneapolis. The group has grown so popular that securing an interview with them is a near impossible feat that this reporter can attest to after failed attempts at getting the group on Skype for a pre-tour interview. Twice, Sauti Sol’s publicist promised an interview with the group, and twice this reporter sat at her computer listening to the birds chirp, as daylight broke in Minneapolis and the afternoon wore on in Nairobi. The metaphorical phone never rang. But such is the price of fame, when one is wanted and needed everywhere at the same time. With fame too, comes a wider audience and a platform from which to share one’s beliefs with the world. Enter Sauti Sol’s newest song ‘Nerea’; a song whose anti-abortion message told from a father-to-be’s perspective has ignited debate surrounding reproductive rights in Kenya. The song, and its accompanying video, which feature fellow musicians Amos and Josh, is a plea to the woman who the song is named after, to keep the baby she is pregnant with. The artists wear white in the video and impose images of a young Lupita Nyong’o, Wangari Maathai, Barack Obama, and Nelson Mandela, among others, implying that the unborn child Nerea is carrying might some day be as famous a figure as these legends. In interview after interview, the members of Sauti Sol have defended their right to artistic expression, in the face of what others see as an attack on women’s reproductive rights. The members argue that the message presented in the song represents their own personal beliefs and is not meant to be divisive, and that ultimately the choice is the woman’s. Sauti Sol insist that ‘Nerea’ is an acknowledgement of a man’s role in creating unexpected pregnancies, and the need for men to “step up” to the plate and become fathers when this happens. Yet for many women, and advocates for women’s rights to reproductive health services, ‘Nerea’ means something different entirely. It represents an attempt to shame women, and demonize them for choosing an abortion, by implying that the unborn children they carry may some day become Nobel Peace Prize winners, or Presidents. This group argues that when abortion, though constitutionally allowed in certain cases, is already frowned upon by society, a song such as ‘Nerea’ only exacerbates the stigma surrounding the right to abortion for a woman, while ignoring all the socio-economic reasons a woman may choose to have an abortion. Whatever side one sits on, or whether you straddle the line between pro-life and pro-choice, the fact remains that Sauti Sol have inspired a needed discussion surrounding reproductive health and men’s role in preventing and dealing with unexpected pregnancies. And done so, while providing a quality song, vocally and instrumentally. This, is Sauti Sol’s greatest feat; providing great entertainment with everything they touch and every appearance they make. With their third studio album Live and Die in Afrika due out this year, catch them live to get a sneak peek of what to expect as the group continues to soar in popularity.